Hello all you Silver Oak lovers! We are all counting down the days till Christmas, watching the calendar with anxious felicity. Sometimes the days go by quickly, but most of the time the days go by really, really slowly, especially as Christmas day and New Year’s Eve draw closer. So, you need something to help you pass the time more quickly. We have the perfect solution for those pre-holiday blues. Silver Oak Online Casino has a very special promotion that makes every day feel like you just got a boat load of presents. The Crazy Days promotion gives you great bonuses, extra comp points, and free chips so you can play to your heart’s content. Mondays are always dull and dreary, right? Well now there is a way to lift that case of the Mondays right here with our Monday Happy Hour special. 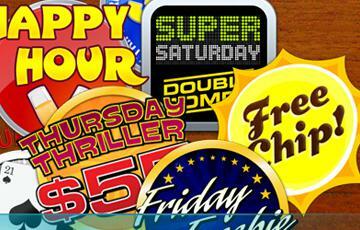 Every Monday from 5 pm to 7 pm you can get an EXTRA 150% on any bonus. You read correctly, an EXTRA 150% on top of any bonus. All you have to do to get your extra 150% is claim any bonus coupon that you want to claim the way you normally would and call the customer service line; they will add the extra 150% to your account. Tuesdays are loads of fun. The theme for Tuesdays is 21. If you love playing Blackjack then you will love the gift we have for you. Silver Oak Casino will give you DOUBLE comp points on all of our Blackjack games. That’s right, play any version of Blackjack and you will receive double comp points throughout the entire day. That way you can get more value for your money. There is nothing more terrific than Terrific Tuesdays! Take a break. It’s the middle of the week. The best way to take a break from the hectic rat race of today’s lifestyle is to kick back and play a few games with some free cash! Get a $50 Free Chip every Wednesday. Yes, get a $50 Free Chip every Wednesday. To qualify, you need to make a deposit on Monday, Tuesday, and Wednesday. You don’t need to make huge deposits, either. They can be modest amounts, but you do have to make deposits on those days. If you have done so, contact our live help and you will receive your $50 Free Chip within minutes. How about having you money be worth more than it is actually worth? That is what happens when you deposit and play on Thursdays. Buy $25 and get $55. It really is that simple. For every $25 deposit you make on Thursdays you will get $55 free. You can use this promo as many times as you like on Thursdays all day. Thank goodness it’s Friday! Fridays are for having fun and taking a load off. So here is the deal we have for you on Fridays. Wager $50 on any of our newest games and you will be nicely rewarded with a $10 credit for being one of the first to try the game. It definitely pays to be first. First come first serve. Check the Silver Oak website to see which ones are the newest games. This bonus can only be used once per week and to receive it you need to contact our customer service staff. The best day of the week is Saturday, for sure. A day to do what you cannot do during the week when you are busy and you have Sunday to relax before starting the week all over again. Now there is one more reason to love Saturdays. Drop by Silver Oak and score double comp points simply by playing any of our sports games on Saturdays. Check out games like Hockey Hero or Fruit Bowl XXV and take advantage of this great promo, too. Sundays are days of rest and relaxation. You gave you time and energy throughout the entire week, and now it is time to get something back. Every Sunday you can get something back from us if you deposited money at any point during the week. If you have done so, and have deposited that same Sunday as well, then you qualify for one of our Sunday bonuses. Check out the Crazy Days page on the Silver Oak website to see which deposit amounts correspond to which bonus amounts. So there you have it. Take advantage of these Crazy Days promotions. They are truly worth it.